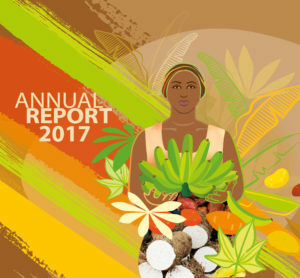 We are pleased to share the 2016 Annual Report from the CGIAR Research Program on Roots, Tubers and Bananas, entitled ‘Research for Innovation and Impact’. We invite you the explore the report as an interactive website where you can also download the PDF. 2016 brought continued successes for our program. We saw major scientific breakthroughs in genomic research that will accelerate the breeding process for banana, and lead to the development of improved crop varieties including disease-resistant cassava, and biofortified potato high in iron and zinc. The World Food Prize was awarded to three scientists from our lead center, the International Potato Center, in recognition of their successful efforts to reduce micronutrient malnutrition by enabling millions of families in sub-Saharan Africa to grow and consume vitamin A-rich orange-fleshed sweetpotato. Over the past year, we estimate that nearly 1.8 million households adopted new technologies as a result of RTB research, and our team made strong progress on gender while also enhancing our emphasis on scaling – all critical steps towards ensuring we achieve lasting impact. Learn more about our achievements and successes in 2016 in the report. This entry was posted in News, News & Events on Aug 21, 2017 by RTB.